In the mid-6th century, the introduction of Buddhism from Korea (Baekje) to Japan resulted in a revival of Japanese sculpture. 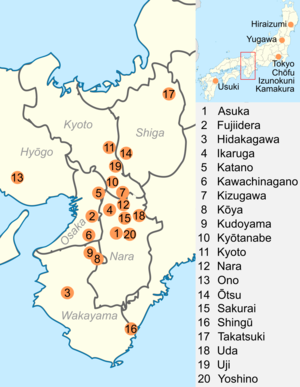 Buddhist monks, artisans and scholars settled around the capital in Yamato Province (present day Nara Prefecture) and passed their techniques to native craftsmen. Consequently, early Japanese sculptures from the Asuka and Hakuhō periods show strong influences of continental art, which initially were characterized by almond-shaped eyes, upward-turned crescent-shaped lips and symmetrically arranged folds in the clothing. The workshop of the Japanese sculptor Tori Busshi, who was strongly influenced by the Northern Wei style, produced works which exemplify such characteristics. The Shakyamuni triad and the Guze Kannon at Hōryū-ji are prime examples. By the late 7th century, wood replaced bronze and copper. By the early Tang dynasty, greater realism was expressed by fuller forms, long narrow slit eyes, softer facial features, flowing garments and embellishments with ornaments such as bracelets and jewels. Two prominent examples of sculptures of this period are the Shō Kannon at Yakushi-ji and the Yumechigai Kannon at Hōryū-ji. During the Nara period, from 710 to 794, the government established and supported workshops called zōbussho, the most prominent of which was located in the capital Nara at Tōdai-ji, which produced Buddhist statuary. Clay, lacquer and wood, in addition to bronze, were used. Stylistically, the sculptures were influenced by the high Tang style, showing fuller body modelling, more natural drapery and a greater sense of movement. Representative examples of Nara period sculpture include the Great Buddha and the Four Heavenly Kings at Tōdai-ji, or the Eight Legions at Kōfuku-ji. Early Heian period works before the mid-10th century appear heavy compared to Nara period statues, carved from single blocks of wood, and characterised by draperies carved with alternating round and sharply cut folds. Stylistically, they followed high to later Tang style. In the Heian period the zōbussho were replaced with temple-run and independent workshops; wood became the primary medium; and a specific Japanese style emerged. By the mid-10th century, the style was refined presenting a more calm and gentle appearance, with attenuated proportions. Jōchō was the most important sculptor of this time, and he used the yosegi technique, in which several pieces of wood are joined to sculpt a single figure. He was the ancestor of three important schools of Japanese Buddhist statuary: the Enpa, Inpa and Keiha school. The Amida Nyorai at Byōdō-in is the only extant work by Jōchō. Japanese sculpture experienced a renaissance during the Kamakura period, led by the Kei school. Partially influenced by Song dynasty China, their sculpture is characterised by realism featuring elaborate top knots, jewelry, and wavy drapery. Although predominantly wooden, bronze was also used as a material for the statues. As a novelty, portrait sculptures of prominent monks were created adjacent to the depiction of Buddhist deities. The term "National Treasure" has been used in Japan to denote cultural properties since 1897. The definition and the criteria have changed since the inception of the term. These sculptures adhere to the current definition, and have been designated national treasures since the Law for the Protection of Cultural Properties came into force on June 9, 1951. The items are selected by the Ministry of Education, Culture, Sports, Science and Technology based on their "especially high historical or artistic value". This list presents 138 entries of sculptures, including those from Classical and early Feudal Japan of the 7th-century Asuka period to the 13th-century Kamakura period, although the number of sculptures is higher, because groups of related sculptures have sometimes been joined to form single entries. The sculptures listed depict Buddhist and Shintō deities or priests venerated as founders of temples. Some of the most ancient sculptures were imported directly from China. Various materials have been used for the sculptures. Although most are wooden, 12 entries in the list are bronze, 11 are lacquer, 7 are made of clay and 1 entry, the Usuki Stone Buddhas, is a stone sculpture. Typically hinoki, Japanese nutmeg, sandalwood and camphorwood were the woods used for the wooden sculptures. Wooden sculptures were often lacquered or covered with gold-leaf. The smallest statue measures around 10 centimetres (3.9 in), whereas the Great Buddhas of Nara and Kamakura are about 13 metres (43 ft) and 15 metres (49 ft) high. The objects on the list are located in Buddhist temples, or in museums associated with temples. Some items are located in shrines, as well as in secular museums. Nara Prefecture is home to the largest number of National Treasure sculptures, with 76 of the 138 entries. Together with the 40 entries located in Kyoto Prefecture, they constitute the bulk of sculptural National Treasures. Hōryū-ji and Kōfuku-ji are the locations with the most entries, with 17 and 18 designations respectively. The table's columns (except for Remarks and Pictures) are sortable pressing the arrows symbols. The following gives an overview of what is included in the table and how the sorting works. Material and technique: wood/bronze/..., lacquered/colored/...; The column entries sort by the main material (stone/clay/wood/lacquer/bronze). Pose: standing/seated Amida Nyorai/Yakushi Nyorai/...; The column entries sort by the name of the principal image or as "set" in the case of sets of sculptures that don't fall under a common group name. Height: height in cm; The column entries sort by the largest height if an entry is a group of statues. 1053Heian period, 1053 woodWood nan/a ??? ^ a b The Usuki Stone Buddhas, the sculptures at Kongō-ji and the 1001 Kannon images at Sanjūsangen-dō date to the late Heian, early Kamakura period and are therefore counted double in this table. ^ The temple uses a different association of statues with names of the generals than the national treasure nomination. Here the temple scheme is used. ^ a b c d The four National Treasure sets of fFour Heavenly Kings at Kōfuku-ji are located in the Eastern Golden Hall (東金堂,, tōkon-dō), the North Octagonal Hall (北円堂, hokuen-dō), and two groups in the South Octagonal Hall (南円堂, nanendō). ^ a b c d Schumacher, Mark (2009). "Buddhist sculpture in Asuka and Hakuho era". Japanese Buddhist Statuary. Retrieved 2009-09-16. ^ "Other Buddhist images of the Asuka period". Asuka Historical Museum. 1995. Retrieved 2009-09-16. ^ Schumacher, Mark (2009). "Buddhist sculpture in Hakuho era". Japanese Buddhist Statuary. Retrieved 2009-09-16. ^ a b Schumacher, Mark (2009). "Buddhist sculpture in Nara era". Japanese Buddhist Statuary. Retrieved 2009-09-16. ^ Schumacher, Mark (2009). "Buddhist sculpture in Heian era". Japanese Buddhist Statuary. Retrieved 2009-09-16. ^ F. Moran, Sherwood (1972). "Early Heian Sculpture at Its Best: Three Outstanding Examples". Artibus Asiae. Artibus Asiae Publishers. 34 (2/3): 119–161. doi:10.2307/3249644. JSTOR 3249644. ^ Schumacher, Mark (2009). "Buddhist sculpture in Kamakura era". Japanese Buddhist Statuary. Retrieved 2009-09-16. ^ a b c The Agency for Cultural Affairs (2008-11-01). 国指定文化財 データベース (in Japanese). Database of National Cultural Properties. Retrieved 2009-04-16. ^ a b c d e f g h i j k l m n o p q r s t Mary Neighbour Parent (2001). "JAANUS - Japanese Architecture and Art Net Users System". Japanese Architectural and Art Historical Terminology (online ed.). Retrieved 2009-04-20. ^ "Konjikido-donai-shozo-and-Tengai". Iwate no bunko. Retrieved 2009-06-04. ^ "Yakushi Nyorai". Yugawa Village. Retrieved 2009-06-05. ^ a b c 国宝を訪ねて (in Japanese). 2009-05-14. Retrieved 2009-06-05. ^ a b c 文化審議会答申 国宝・重要文化財（美術工芸品）の指定について [Council of Cultural Affairs: Designation of National Treasures and Important Cultural Properties in the Arts and Crafts category] (PDF) (in Japanese). Agency for Cultural Affairs. 2017-03-10. Retrieved 2017-11-13. ^ 国宝銅造釈迦如来像 [National Treasure gilt bronze Shakyamuni (Shaka Nyorai)] (in Japanese). Jindai-ji. Retrieved 2017-11-13. ^ "Jindaiji Temple" (PDF). Jindai-ji. Retrieved 2017-11-13. ^ "【国宝】願成就院の運慶作諸仏" [National Treasure, various Buddhas by Unkei]. Izunokuni. 2013. Retrieved 2013-06-22. ^ a b c d e f g h i j k l m n o p q r s t u v w x y z aa ab ac ad ae af ag ah ai aj ak al am an ao ap aq ar as at au av aw ax 仏教索引 (in Japanese). Retrieved 2009-06-14. ^ 三井寺＞名宝の紹介＞秘仏＞新羅明神坐像 (in Japanese). Mii-dera. 2002. Retrieved 2009-06-08. ^ 三井寺＞名宝の紹介＞秘仏＞智証大師坐像（御骨大師） (in Japanese). Mii-dera. 2002. Retrieved 2009-06-08. ^ 三井寺＞名宝の紹介＞秘仏＞智証大師坐像（中尊大師） (in Japanese). Mii-dera. 2002. Retrieved 2009-06-08. ^ "gochi nyorai". JAANUS - Japanese Architecture and Art Net Users System. 2001. Retrieved 2019-03-22. ^ Schumacher, Mark (2009). "Bosatsu on clouds". Japanese Buddhist Statuary. Retrieved 2009-09-16. ^ Christine Guth Kanda (1985). Shinzō. Harvard Univ Asia Center. p. 51. ISBN 0-674-80650-6. Retrieved 2009-06-13. ^ 仏像紹介 (in Japanese). Gantoku-ji. Archived from the original on 2010-05-15. Retrieved 2009-06-13. ^ 木造聖観音立像（国宝　木造虚空蔵菩薩立像） [Shō Kannon (National Treasure Kokūzō Bosatsu)]. Daigoji Cultural Assets Archive (in Japanese). Daigo-ji. Retrieved 2015-09-22. ^ a b 京都・醍醐寺の菩薩像、国宝に　文化審答申、東大寺の弥勒仏像も [National Treasure report, Kyoto Daigoji Bosatsu and Tōdaiji Maitreya] (in Japanese). Kyoto Shimbun. Retrieved 2015-09-22. ^ a b "nyoirinkannon". JAANUS - Japanese Architecture and Art Net Users System. 2009. Retrieved 2009-09-19. ^ 文化財 [Cultural Assets] (in Japanese). Kongō-ji. 2017. Retrieved 2017-11-14. ^ a b c d e "Kofuku-ji" (leaflet). Kofuku-ji. ^ a b c "Yakushi-ji" (leaflet). Yakushi-ji. ^ Schumacher, Mark (2009). "Birushana Buddha". Japanese Buddhist Statuary. Retrieved 2009-09-19. ^ "彫刻の部 重要文化財を国宝に" [National Treasure designation (Sculptures)] (PDF). Nara Prefecture. 2015. Retrieved 2015-09-22. ^ "寺宝・文化財" [Cultural Assets]. Abe Monju-in. 2013. Retrieved 2013-06-22. ^ "国宝（美術工芸品）の指定" [National Treasure designation (Fine arts and crafts)] (PDF). Nara Prefecture. 2013. Retrieved 2013-06-22. ^ Schumacher, Mark (2009). "Ishidoro". Japanese Buddhist Statuary. Retrieved 2009-09-16. ^ Christine Guth Kanda (1985). Shinzō. Harvard Univ Asia Center. pp. 81–85. ISBN 0-674-80650-6. Retrieved 2009-06-13. ^ 木造四天王立像 [Four Heavenly Kings] (in Japanese). Kofuku-ji. Retrieved 2018-03-10. ^ 木造法相六祖坐像（もくぞうほつそうろくそざぞう） 「国宝」「重要文化財」 文化財 法相宗大本山　興福寺 (in Japanese). Kofuku-ji. Retrieved 2009-06-16. ^ 【国宝（美術工芸品）の指定 [Designation of arts and crafts national treasures] (PDF) (in Japanese). Agency for Cultural Affairs. 2016. Archived from the original (PDF) on 2016-11-23. Retrieved 2016-11-23. ^ "2016 Newly Designated National Treasures and Important Cultural Properties". Tokyo National Museum. 2016. Archived from the original on 2016-11-23. Retrieved 2016-11-23. ^ "Ise Jingu and Treasures of Shinto" (exhibition leaflet). Tokyo National Museum. 2009. ^ James M. Goodwin; Janet R. Goodwin. "The Usuki Site". Archived from the original on 2008-12-03. Retrieved 2009-06-16. Ogawa, Kouzou; Seki, Nobuko; Yamazaki, Takayuki (2009). 仏像. 山溪カラー名鑑 (in Japanese) (2nd ed.). 1-19-13 Akasaka Minato-ku Tokyo Japan: YAMA-KEI. ISBN 978-4-635-09031-5. .
Wikimedia Commons has media related to National Treasure sculptures.